Police, has on the third attempt, cleared Kyadondo East MP Robert Kyagulanyi aka Bobi Wine’s Kyarenga concert. 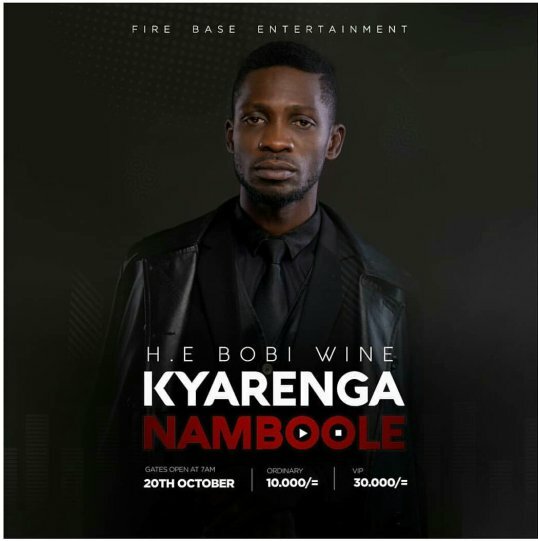 Having been tossed around and frustrated by both the management of the 40,000-seater Namboole stadium and the police at least twice, Bobi Wine has now decided to take the much awaited Kyarenga album launch to his One Love Beach in Busaabala on November 10, 2018. The concert, initially slated to take place at Namboole on October 20, was blocked by police on grounds that it was not part of the events booked to utilize the facility on that day – among them a wedding. When a new date was agreed upon with the stadium management and the launch rescheduled to Friday November 9, the Federation of Uganda Football Association (FUFA) wrote to Namboole management cautioning them against holding a concert that would damage the pitch ahead of Uganda Cranes’ game against Cape Verde on Saturday 17th November 2018. Now, the Busaabala concert has been cleared by the Inspector General of Police (IGP) Okoth Ochola. According to police spokesperson Emilian Kayima, the concert has been cleared to take place even though there is some nitty-gritty issues that are yet to be handled. “The remaining issues like police deployment will be handled by Kampala Metropolitan Police but the organisers have met all the requirements as per the Public Order Management Act (POMA) for the concert to go one,” Kayima said. Earlier, Bobi Wine urged Ugandans to ‘forgive’ police and Namboole for blocking the concert because just like all other state institutions, they have been hijacked by President Yoweri Museveni. There are fears within government that allowing Bobi Wine who commands a huge following among the majority youth to host a concert within the city, might create a Tunisia like situation when thousands of protestors refused to leave the streets which led to the ousting of longtime President Ben Ali in January 2011. We shall keep you posted with the latest on the Kyarenga concert here at Flash Uganda media.